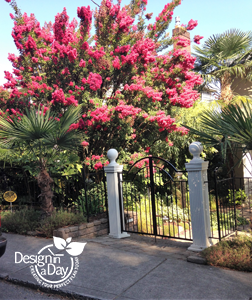 I like to use Nandina as a colorful four season plant for my Portland landscape designs. The foliage is colorful year around. Very low maintenance plants if you know the cool pruning tip. They are easy to prune successfully so you can keep them for years. Nandina varieties fit multiple diverse needs in the landscape because they can be small (18″ to 24” tall) or up to 8 feet tall. They thrive in half or full day sun. Deer don’t typically eat them. 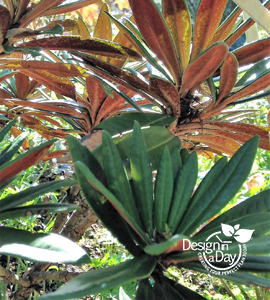 People prune it wrong and then it’s so ugly they remove them – this is so easy to avoid. Many varieties require a lot of sun and will look leggy and sparse in the shade. They will look so bad they will be removed. Some varieties will take more shade so you have to know which is which. Best practice is to plant in at least 4 hours of strong sun. People think Nandina is drought tolerant and they don’t water it in the summer……….this ends badly. Nandina (from China) doesn’t feed our native insects; therefore, overusing it limits food for our native bird population. I like to select at least a few native plants for companions. Is this plant overused? 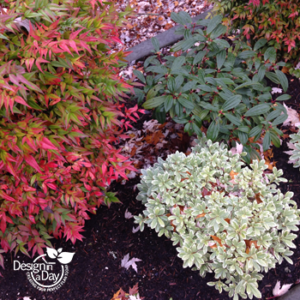 Some garden designers snub the Nandina plant because it is used in commercial landscapes. 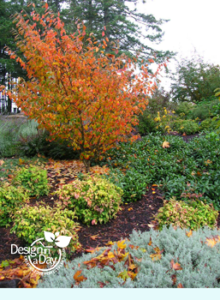 Nandina is useful to my Portland residential landscape design clients who want low maintenance landscapes. 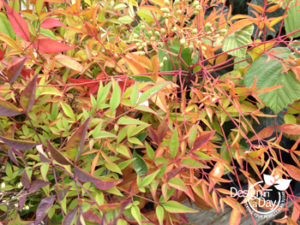 With the right plant partners Nandina can sparkle in a home landscape. 2 to 4 foot tall ‘Sienna Sunrise’, ‘Moon Bay’ or ‘Firepower’ work well in foundation plantings and entry areas. Use a tape measure on planting day, assume the size info on the plant tag is being modest and give your plant more room to grow. Some varieties of Nandina will grow 3 to 4 feet wide. To keep your Nandina from getting too wide, I suggest pruning out entire canes at the base of the plant once a year. 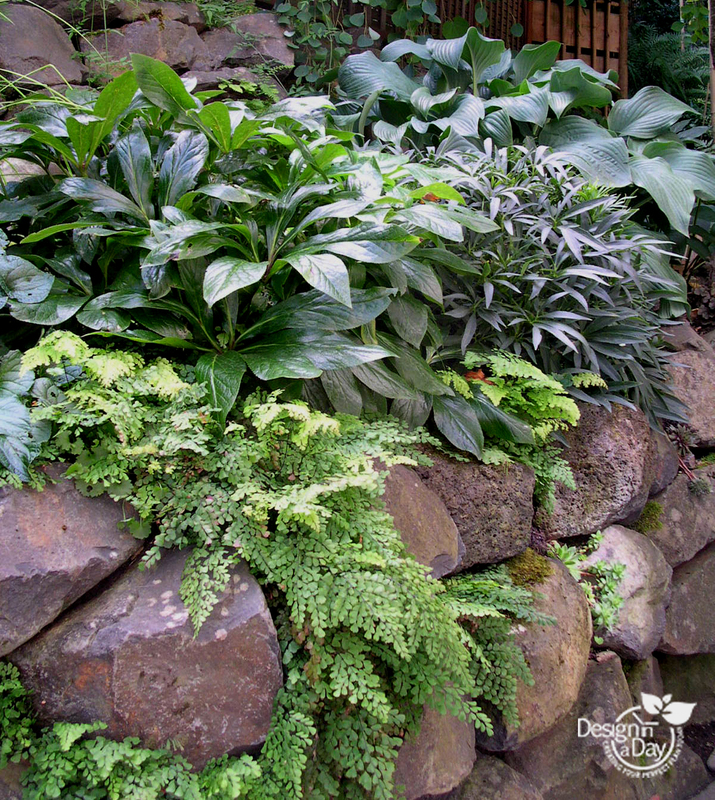 For varieties that are listed as 3 to 4 feet wide, plant it at least 30 inches off your path. 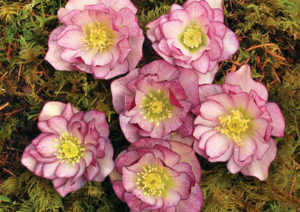 A new variety called ‘Blush’ is typically 24 inches tall and 18 inches wide. The evergreen leaves turn an intense claret red and hold their color for months, longer and redder than other Nandina. 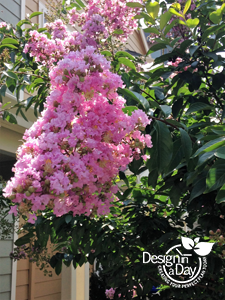 ‘Blush’ was designed for the southern United States where it is fully drought tolerant. In Portland, all varieties of Nandina including ‘Blush’, requires irrigation in summer. Multiple articles on the net enthusiastically state ‘Blush’ is drought tolerant but they do not mean here in the NW. In the high humidity of an Alabama summer I too am probably drought tolerant…..Mint Julep anyone? 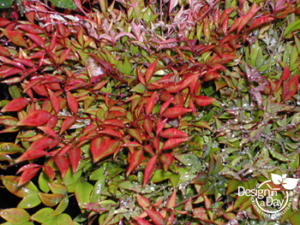 I love to combine Nandina with textured or needled plants that contrast with the narrow Nandina leaves. Dwarf conifers, (Pinus mugo ‘Sherwoods Compact’), heather Erica carnea ‘Adrienne Duncan’ or ornamental grasses like Opiopogon (black mondo grass) work well. NW native plants, like salal, sword fern and huckleberry give contrast and good looks. They also provide food for native insects and for our birds who must eat native insects for food. Pairing Nandina with typical cottage garden plants disappoints my aesthetic; there isn’t enough leaf contrast. The key to success with Nandina is learning how to prune it which is all about thinning the multiple canes (or stems) of the shrub. Read more in my next blog or check out this u tube video I found to get you started. 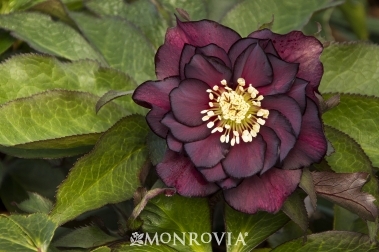 Helleborus x hybridus ‘Ashwood Double BiColor Shades’ grown here in the NW by Monrovia. Red flowered Hellebores are still the holy grail for plant geeks but they are so tough that anyone can covet these and grow them. 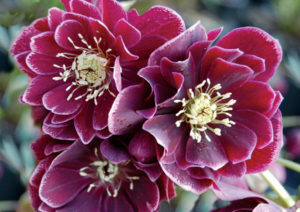 ‘Peppermint Ice’, ‘Amethyst Gem’ and ‘Ashwood Double Bi Color Shades’ are Hellebore cultivated varieties with red to eggplant hued double flowers. They wow us in late winter with a long vibrant flower display. As a Portland landscape designer I like to use Hellebore in my designs. The Helleborus x hybridus plants (which is what we are focusing on today) can live for a hundred years, deer don’t like them, they are low water and except for a typically minor problem with aphids, and a little slug activity they are pretty pest free. Peppermint Ice has a darker outline around each of the petals. Its adds a lighter touch with pink red flowers. 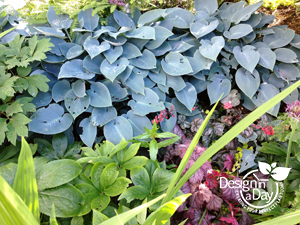 They are shade tolerant although I tend to use these three in strong morning sun with dappled or full afternoon shade. Amythest Gem comes from the famous NW Garden Nursery. Double petals with a light edge gives us drama and the constrast needed to appreciate the mass of petals. Double flowers give us more color than the singles but the singles, with only 5 to 7 petals, are also stunning and low maintenance. ‘Ashwood Double BiColor Shades’ have a wine red petal with a darker edge which is opposite of ‘Amethyst Gem’. The flowers last a long time in the landscape but not long as a cut flower because the stems wither quickly. Most people cut the stems off and float them in a bowl. I’ve picked them from my NW Portland garden, knowing they would only look good for a few days. There are techniques for making them last which involve picking them at the right time based on the age of the flower and using an alcohol solution in the vase. Follow this link to NW Garden Nursery and read the bottom of their culture sheet. Now that you are bringing the flowers inside please be aware that all parts of the plant are toxic. 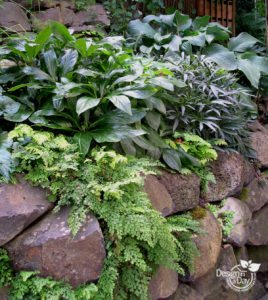 Hellebore foliage looks fantastic with the lacy Himalayan Maidenhair Fern (Adiantum venustum) on this wall of boulders. 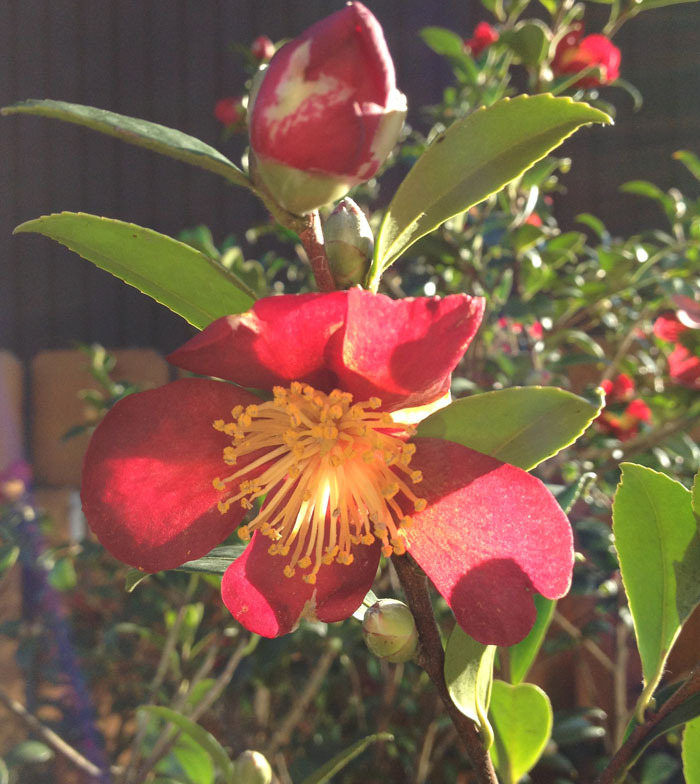 plant to flower in winter. 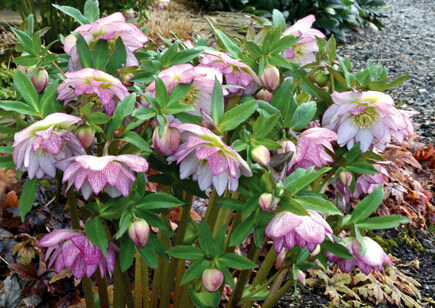 Of course, it’s not just the flowers that encourage me to use hellebores in landscape designs. 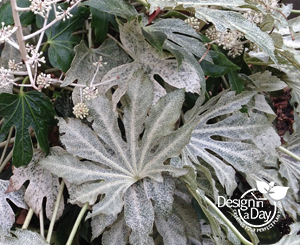 The leaves are leathery, attractive and provide interesting contrast with a range of plant material including feathery fern fronds, ornamental grasses or tiny leafed boxwood. 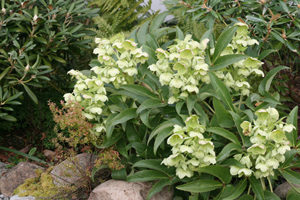 The summer foliage of hellebores look great with many plants including Sweet Flag (Acorus gramineus). What about aphids? My only problem with Hellebore is aphids. Some years I don’t have any noticeable aphid activity. When I do it’s so early in the year that handy predators like lacewing and lady bug are still in sleep mode or haven’t hatched yet so I’m on my own. Dealing with them is easy. 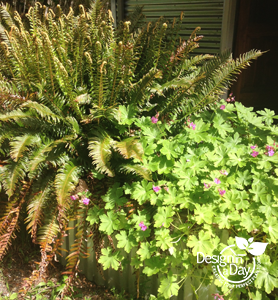 Use a spray bottle filled with water or 1 tsp of dish soap to 1 gallon of water and spray down your plant. Use your hose or this great gadget called the bug blaster which you can buy at Portland Nursery. (I’ve got to get one this year to use in my veggie garden too.) Don’t use a pesticide because most of them will harm bees even if they are not present when you spray. Aphids have soft bodies and will be damaged by the force of the water or the soapy solution will invade their bodies and disable them. You will have to knock them down with water or soapy water once or twice a week to prevent the temporary cosmetic damage. I’ve never lost a hellebore plant to anything let alone a virus but in recent years virus has spread from plant to plant by aphids. It is only an issue for professional growers or collectors. How to care for your Hellebore: I water once or twice a week its first summer and then once a week after that. 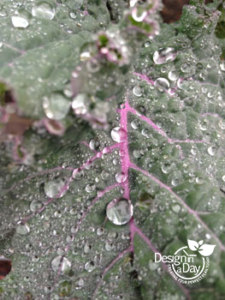 Drip irrigation would be best rather than overhead sprinklers because drip can water deep into the soil. 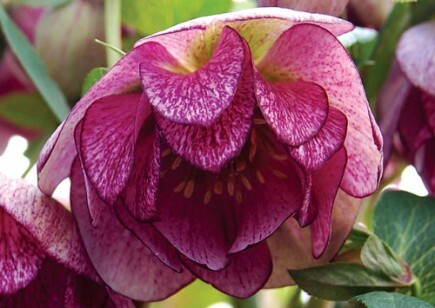 Established Hellebore become quite a low water needs plant and might be content with every ten days or less. 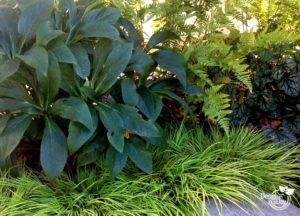 An application of mulch around the plant once or twice a year is a good practice. If your soil is so good that they make seedlings, be aware they won’t have the same flower as your hybridized plant. I cut the old leaves off the plant in late winter so that the flowers are not visually diminished by the previous years worn foliage. Plant it in a low spot where winter rain will rot the roots. Over water it and fertilize it heavily. Helleborus x Hybridus ‘Peppermint Ice’ is another Winter Gem by NW Garden Nursery. It is grown by Terra Nova so is available at local garden nurseries. Photo by Terra Nova. Helleborus x Hybridus ‘Peppermint Ice’ has double flowers that hang down but the overall effecting your winter landscape is very colorful. The flowers last a long time. I love having a vegetable garden. It’s healthy, right? I love eating kale and I grow a lot of greens for smoothies year-round. There are a few concerns about growing food in urban areas. Two concerns that apply to us all, city and suburban, are lead paint and lead exhaust from the past in our soils. Let’s be practical not scary about this. Is my food safe to eat? What are the most important practices I can do and how can I keep it simple? My garden is below Highway 30. It’s an old heavily traveled highway so our soil has years of exposure to lead exhaust. There’s no way I’d grow my food in the ground here. 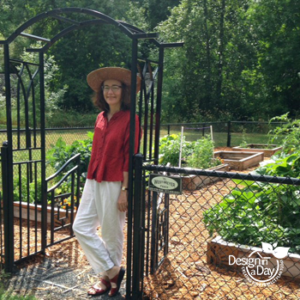 Our community garden has raised beds with new clean soil from just three years ago. I apply lots of compost at least three times a year. My garden supplies me with year round greens like kale. I use an organic fertilizer. (OK it’s boxed Dr. Earth, not a truckload from Natures Needs because it’s very convenient and my garden is small.) I don’t know what my NPK ratio is which makes me a bit of a lazy gardener but the food I like to grow does fine. NPK being Nitrogen, Potassium, Phosphorous. And yes I was trained as an advanced master gardener and yes that was a very long time ago………they teach you all about soil in the master gardener program. I wash my produce, no nibbling right out of the garden bed. (OK once in a while a strawberry or tomato). According to some experts I’m doing OK but I could do a lot better. Soil areas next to old garages often have higher lead levels. Reducing exposure to dust is the most effective thing you can do to reduce lead hazard in your landscape. It is typically in the first few inches of soil. This is the most important thing in the blog. Mulch and compost applications cover your soil and protect it from dust with contaminants in it. We want to keep the dust and soil off human skin and out of the mouth. This is critical for babies and small children and good for the rest of us too. Adding compost has many benefits for improving conditions for plants. Adding compost at least twice a year can only benefit, there are no drawbacks. Here at my community garden, we could have put a barrier between our new soil and the existing ground soil. I can still do this once my winter Kale are done in March. I’ll have to get a tarp and dig out a lot of my soil so I’m going to install a metal grid and landscape fabric. The grid is to keep the moles and gophers out of my raised bed. They may have brought some of the lead contaminated soil up into my new clean soil, and they caused a lot of havoc with the roots of my plants. Some died or did not produce well because of the soil disturbance. I could improve the efficacy of washing my veggies by using a 1 percent vinegar solution instead of only using water. I’m thinking a large spray bottle under the sink could be used for my final wash. It’s got to be simple or I won’t do it. Beyond these good soil management practices, I will need to do a Nutrient Analysis soil test to know what I need to add to my raised beds to improve the health and productivity of my vegetables and bind up any lead and keep it locked into my soil where it won’t cause problems for me. My garden is below Highway 30. It’s an old heavily traveled highway so our soil has years of exposure to lead exhaust. My client Katy had an older home in SE Portland. I suggested a lead soil test. She collected the soil and submitted samples for a lead test. She discovered the area where we wanted the kids play structure to go had high lead. It was next to the neighbors’ garage. Several inches of contaminated soil were removed. She brought in new soil and playground chips and now has a safe play area for her toddlers. 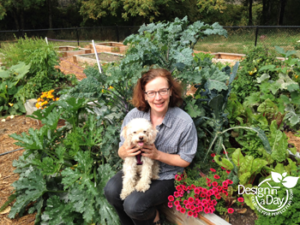 What’s one new thing you could do this year to improve your landscape or edibles garden? Get your soil tested. I’m planning to collect soil from my vegetable garden and submit it to a lab for testing. I’ll share that experience with you in another blog.